When it comes to choosing a tablet, the task can be more daunting than choosing a smartphone. With smartphones, we know what we need to suit our lifestyle. Do tablets really require the same amount of features? Not usually. I’ve come up with five Android tablets which I believe are the best options available today for us Canadians. You don’t have to scour the internet for too long before noting that the Nvidia Shield Tablet is a, if not the top choice among Android tablets. This was primarily marketed towards gamers, and it will most certainly do the job to run the most processing-intensive Android games. If you’re not into gaming, well, this tablet is still a fantastic option. With this tablet you’re getting two front facing speakers. 5-megapixel cameras are found on both and the back of the device. If you’re short on internal space, you have the option to use a microSD card in the expansion slot. A micro HDMI port is also present for those of you who aren’t using options like the Chrome Cast to mirror your screen to your TV. As shown in the photo, the Shield comes with a stylus - a personal appeal as one who enjoys digital drawing and painting. You can of course use the stylus for other tasks such as taking notes. The OS is very close to stock Android, which I know many people prefer and enjoy. Currently it sits at version 5.0.1 Lollipop, meaning Nvidia hasn’t stalled on updates since the release of this device back in July of 2014. Spec-wise, the Shield is still impressive with its Quad-core 2.2 GHz Cortex-A15 processor, and the 1920 x 1200 pixels (~283 ppi pixel density) 8” display. The Nvidia Shield Tablet will cost around $329.00 CDN depending on which you pick it up from. Coming in at a close second is the Nexus 9 by HTC. It seems to take some design cues from the Apple iPad when looking at the front of it head-on, especially with the 4:3 ratio. However, that’s about as close as they will get to each other when compared. The Nexus 9 has a 8.9”, 2048 x 1536 IPS LCD with a 4:3 ratio. Inside the tablet are Nvidia's K1 Tegra processor, and 2GB RAM. HTC’s popular front-facing speakers are here too, and I hear (pun?) they sound awesome. If you’re looking to shoot some photos with your large tablet, an 8MP rear camera is present, even with an LED flash. Up front is a 1.6MP camera. Being a Nexus device, it of course comes with pure Android, and currently sits at version 5.0.1 Lollipop. Future updates should appear over the air (OTA) quite a bit faster than other non-Nexus Android devices. A definite perk for those of us who prefer to be as current as possible. This will cost you around $429.99 depending on where you purchase it from. Dell claims this tablet to be the world’s thinnest tablet. At just 6.1mm thick, that’s hard to debate. The body of this tablet looks really great too, so long as you can look past the unique placement of the front-facing 2MP camera. Taking photos with this tablet is doable as it is equipped with an 8MP camera. This is an 8.4” tablet with a 1600 x 2560 pixels (~359 ppi pixel density) OLED screen. The processor is an Intel Atom Z3580 processor with a Quad-core 2.3 GHz CPU. Surely, this tablet will handle nearly anything you can throw at it. If the 16GB of onboard memory runs out, you have the option of expanding to 512GB via microSD. Stereo speakers are also on the front of this device which makes for great listening when watching movies, YouTube, and the like. In case you haven’t noticed a pattern - I really like front-facing speakers on tablets. I own a Nexus 7 (2013) and this is one feature I really wish I had. Ryan Moore reviewed the DEll Venue 8 7000 (wow, what a name!) recently, so be certain to check his article! If you’re interested in buying this one, it’s a bit on the expensive side at $479.99. However, that’s still cheaper than a lot other options out there and certainly looks to be worth the value. Now to switch it up a little from the first three. The Asus Pad 7 is a smaller tablet at 7” and is comparable in size and design to the Asus Nexus 7. That said, if you look at the photo above, it is notably different. The screen has a resolution of 1200 x 1920 pixels (~323 ppi pixel density), and is powered by an Intel Atom Z3560 Quad-core 1.83 GHz processor. This won’t be a gaming machine, but it will handle movies, word processing, and other apps just fine. You have the option to get this device in either 16GB or 32GB. If you need more room, it is expandable to 64GB via microSD. For your photo taking needs, this tablet has a 2MP camera up front and 5MP on the back. I’ve been drawn to the Sony Xperia Z series for a while now. In fact, I’ve been waiting for my contract to come to a close so I can jump carriers and pick up an Xperia Z3 or Z3c. Picking the Z3 Compact Tablet may now seem biased, but honestly, this tablet came up quite a bit online during my research. I can certainly see why reviewers have set this one on a high pedestal. This 8.1” tablet has a 1200 x 1920 pixels (~283 ppi pixel density) display, covered by shatterproof glass and oleophobic coating. The Qualcomm MSM8974AB Snapdragon 801 processor and Quad-core 2.5 GHz Krait 400 CPU will keep things running smoothly. The one perk I personally favor, especially as a father of small children (5 and 2), is that this device is IP68 certified, meaning it is both dust tight and water resistant over 1 meter, for 30 minutes. I don’t need to keep this device hidden far away if I am doing dishes, having a shower, or even by a swimming pool. Nor should I be too concerned if this somehow ended up in the toilet by 2 year old - although I’d really prefer that to never happen. For me, this would be the best option if I wanted to snap photos of my kids. The tablet comes with an 8.1MP camera on the back, and a 2.2MP camera for some fun selfies. PS4 owners (such as myself) can take advantage of owning another Sony in the home with the PS4 Remote Play ability. Sit on the couch, sync the controller to your tablet, and play games off the PS4. Cool! These goodies do come at a cost though. For us in Canada, the price comes in at $529.99. 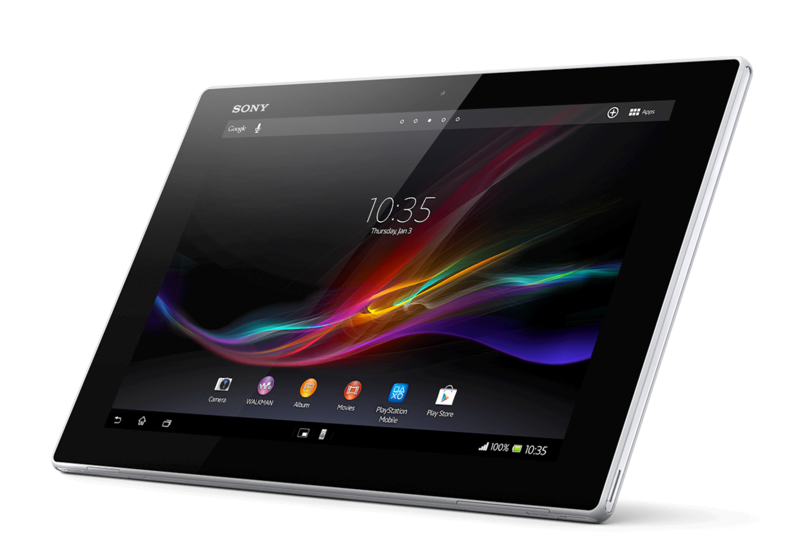 So while the top dog these days appears to be the Nvidia Shield Tablet, I’d personally save my pennies for the Sony Xperia Z3 Compact Tablet. We all have our wants and needs for these devices. My hope is one of these five suits yours. What do you think? Do I have these in the right order? Should one or more be swapped out for another tablet entirely? Let me know in the comments below!